Clear shipping labels are inevitable for any small or bulk domestic or international shipment. They are the basic requirement of the retailers, manufacturers or e-commerce sellers who regularly ship packages to customers in short and long distances. Shipping labels are simply the peel and stick tag that includes some crucial information about the shipment including Ship to address, ship from name and address, tracking number barcode, among others. The labels also include other details related to the package such as special handling needs or alert handlers of hazardous contents. 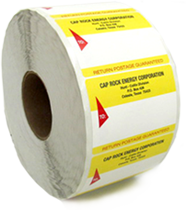 At Performance Label Company (PLC) we produce a wide range of clean and consistent shipping labels printed with all that necessary information to assure asset tracking and content identification. The following capabilities enable the team PLC to create and print custom shipping labels as per the customers’ application requirements. Writing the shipping address and other crucial information about the shipment manually on the packaging no longer considered practical by businesses. There are chances of spelling errors, undecipherable letters, wrong information, and fading letters, causing troubles to the shipping companies. However, specially created shipping labels have made the things easier by carrying crucial information to get the package to the receiver’s door. What else are the beneficial features of these labels? Customized Information : At PLC, we help produce labels with customized information that streamline the processes such as receiving goods, inventory management, and asset-tracking. Extreme Durability : Packages are prone to heavy impact or harsh handling during transit. PLC considers the tough handling of the packaging, and hence utilizes tamper and scratch resistant materials in the label making. Also, the use of water proof material limits the fading of information being printed. Prevents Damage : The shipping labels can also be provided with special handling instructions. This includes instructions and warnings like ‘Fragile’ or ‘Do Not Stack’. We are proud to serve thousands of customers from the following industries. We aim 100% customer satisfaction. Hence, being a customer-centric firm, we put every effort to maximize satisfaction by designing, manufacturing, and delivering eye-catching and durable custom printed labels. With high quality and competitive prices on all wholesale product labels and stickers, we have made a mark in the industry. Do you have specific requirements? Please request a quote today. You can also contact us to receive the quote by phone or mail. Copyright © 2016 all rights reserved.Performance Label Co.